PROSCREED is a BBA Hapas certified screed applied two-part banding system consisting of a plasticised rosin ester binder blended with thermoplastic rubber and acetate co-polymer incorporating selected high PSV aggregate (Calcined Bauxite or Granite) fused to a specially formulated polymerised bituminous sealant. PROSCREED can permanently and economically repair cracks, seams and joints in all non porous bituminuous road surfaces up to 40mm wide with standard 100/150/200mm surface band widths. It is designed to have a high surface skid resistance value throughout its extended life. It is suitable for use on bends, roundabouts and can even be used to repair Clause 924 High Friction Surfacing when combined with calcined bauxite for maximum skid resistance. 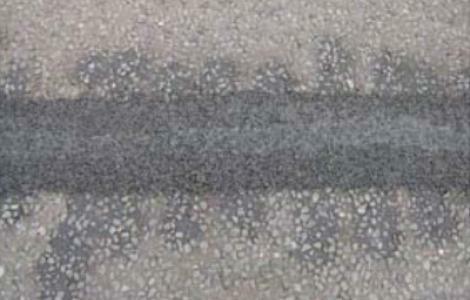 PROSCREED can also be used to repair potholes, and cracks wider than 40mm if required. PROSCREED has several advantages over competing systems. Application is less susceptible to weather extremes. Can be laid all year round. Rapid curing, typically 15 minutes after completion. Highest Skid Resistance for added safety. Quicker application minimises disruption and traffic management costs. Environmentally friendly, no waste for landfill and no loose chippings. PROSCREED is available in two grades, Standard and High Friction (HF). Standard PROSCREED incorporates 2-3mm Grey Granite Aggregate. PROSCREED (HF) incorporates 1-3mm Grey Calcined Bauxite Aggregate. PROSCREED’s combination of macro and micro texture is designed to optimise initial and long term skid resistance. *Based on the average of a minimum of 10 readings by the Sand-Patch Method, as defined in BS 598-105:2000, at equally spaced intervals along the length of PROSCREED being assessed,. *Measured by Pendulum Tester to TRRL Road Note 27:1969. PROSCREED Part B’s standard colour is black. PROSCREED HF can be produced in a range of colours including buff, red and green, but it is important to appreciate that traces of black PROSCREED Part A may be visible above the sealed crack.